On behalf of The Neighborhood, inclusive of the artists, the voting committees, the chairs and the audience, it gives me great pleasure to introduce the…. They are such different people, from very different parts of a randomly confused United States. Each represents different demographics, that until last night when sweet home Alabama became the adult in the room, halting a cliff divide by a leary nation, perhaps not these three, but others like them may have taken it all the way. The trio walked in at separate times, all wanting to give something of themselves and needing to receive something in return, but for reasons only they would understand. How they come to appear on the same underground stage, is not because of or even in spite of differences, but as passionate believers, in that the search for common ground begins in the imagination and can be found in the collaborative arts. Once a forced recluse, Rebecca Lemke held a fierce determination to grow, to learn and to tell her story, while building her career. We watched her blossom, becoming one of the most dynamic personalities of more than 250 talented artists, that left something behind from time spent here. Features in Huff Post, The Federalists, a best selling book of inspiration on Amazon, and recently in southern California for production on a national podcast, she is flying on rare air, but remains humble yet determined to soar. A seemingly shy longshot in A Star is Born – our most popular and successful show – round by round, she delivered a performance that rivaled network talent. When the smoke finally cleared, at just 19 years old, Lemke had quietly mowed down a veteran field. Jamal Marvelle may not be seen as a trailblazer in the gay community, but in his debut – by way of the acclaimed Family – he offered normalcy to young gay men, still unsure about living openly in a freer, yet still hostile outer society. “My husband is white, I’m black, and that makes us an interracial couple – that happens to be gay.” When Marvelle made this as-a-matter-affect declaration, he was neither seeking to promote his lifestyle nor trying to justify his life. No chips did he carry on his shoulders, and no shame hidden behind an anonymous name. No secret agenda revealed at the end, in a personal essay he simply told us his name. In nearly 3 years, he has neither backed down nor felt offended with his accidental role as our ‘go-to-Black-gay-man’ (a 3rd place finish in The Search for Common Ground); but rather, he has approached each project as a teachable moment. That approach has made him the most enduring male, and of the most important artist The Neighborhood has ever known. For reaching out and reaching back, for never feeling different – better or worse; for your welcoming approach and for accepting the respect received, by giving respect right back…. 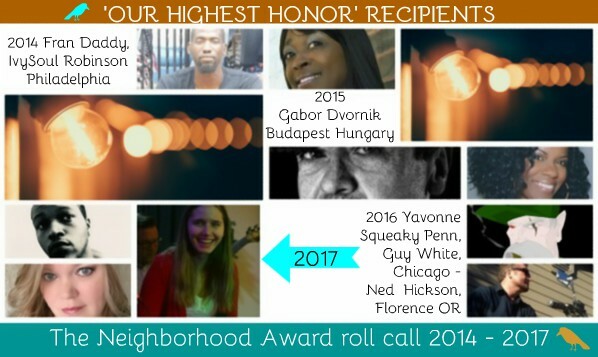 it is For Everything, that The Neighborhood Award ‘OUR HIGHEST HONOR’ is bestowed on Jamal Marvelle, the 8th Artist. Let me start by saying I’m sorry. This has been a trying year for me professionally – and I say that with everything outside of my regular 9-to-5 gig in mind. I haven’t been able to contribute to The Neighborhood like I’ve wanted to this past year, but I’m so thankful for those of you who remembered the work I did share with the group and all its talented members and spectators. You all are the reason I keep at my craft. Even when I’m in the deepest level of exhaustion, my fingers find their way to my laptop’s keyboard and off I go. I wouldn’t be lying if I said I was a little caught off guard by this honor. I started Gays in the Life as a way to condition my writing chops for a larger writing project almost three and half years ago. How many of you have heard me share that fact by now? All jokes aside, it’s because of supporters like Kendall and members of The Neighborhood that has afforded my platform the chance to become a life source of its own… and for that, I thank you. I lived a somewhat sheltered life being born and raised in Alaska. My parents are from Camden, New Jersey and Chicago, Illinois and know what it is to exist in this world as people of color. They protected my siblings and I by not forcing the harshness of the world down our throats, but by taking the opportunity to explain why an injustice had occurred – as they happened – against someone who looked like we did. I appreciate them both for this as it gave me a chance to form my opinions of the world based on my experience as young, black (and at the time, closeted) man. Having received the votes and privilege of all your attention this cold, December evening – Yes, it’s freezing in Indianapolis currently – I want to make you all a promise. I promise to continue educating people, from all walks of life, through my experiences in a real and honest way. My intention with my platform is not to preach, but to share. Share my husband and I’s existence as an interracial couple in the Midwest. Share my experience as a gay man of color navigating life in the corporate world. And not to mention, the many wellness tidbits – like home decor, yoga and meditation – that keep me centered enough to continue sharing with all of you. Thank you all for being the life source of my work and the heartbeat of The Neighborhood. You all mean more than you know. On March 1st 2015, Opening Day of Season IV was an original blogging experience, a first of its kind event. Twenty-three artists from 16 cities in seven countries filled 8 stages, inclusive of a music festival – debuting two world premiers; a short film festival with an entry from an understudy of HBO; a photographer’s viewing party and even an original short story that combined the talents of Person, Dvornik and composer Renan Javier in the original presentation of The Exorcist. And while the entire day was billed as the ultimate artists collaboration, in the spirit of competition and for the first time, the box office was made public (stats/comments/shares). Atop the charts, was not Trader the slick short film from director Matt Salvo. It was not the world premier Spend it On You by Swift Slay featuring a popular Nino Brown. And in a depth-defying upset, nor was it the highly publicized conclusion to a 3-part serial thriller written by Kendall F. Person, himself. The No. 1 show was a duet in the form of a poem. Along with Oscar Plascencia, Kelly Lewis sizzled, creating a defining moment – not for her, that would come later in a song she wrote called Chasing the Dream – but for the collaborative itself. Kelly Lewis’ inner femme fatale took over, leading to a shocking finale, while the roof caught fire and burned on the Poetry Stage. The Neighborhood Award ‘OUR HIGHEST HONOR’ is bestowed upon Kelly Lewis, the 9th Artist. And marking thepublicblogger December 30th 5 Year Anniversary, Kelly Lewis has been named the Most Valuable Artist (MVP) to ever grace The Neighborhood stage. The year was 2014; I was completely green and new to blogging when Mr. Kendall F. Person invited me to The Neighborhood for a “show”. Little did I know, how it’d go or what it meant to be in a show at that time. I was that age-old cliché; a poet and didn’t even know it. Up until this point I was merely playing with words, which I later learned was called free verse. To write a piece of official poetry and take the stage seemed completely absurd. Yet, my curiosity outweighed my timidity. I wrote 3 narrative pieces as my debut for “The Meaning of Life” series, and it (cue drama card) literally changed my life and the way I write. In all seriousness, it is truly an honor to be a member of this community. I am thankful to everyone who comes here with intent, purpose, support and open minds that share their many talents to entertain, inspire and educate. I appreciate the collaborations and challenges I’ve been able to partake in both on and off the stage. Most of all, I appreciate our Producer & Host, Kendall F. Person, for providing this wonderfully connected forum, and for believing in me, challenging me and putting up with me. I respectfully accept this Highest Honor award and look forward to everything that is yet to come. Thank you! Thank you! I was pleasantly surprised by these recognitions! Hey Jamal – congrats! Enjoyed your contributions and look forward to reading more of your words. Thank you so much KP!! Congrats, Rebecca. It is remarkable how much you’ve blossomed! Thank you Kelly! Congratulations to you as well! Thank you so much to The Neighborhood for this award!